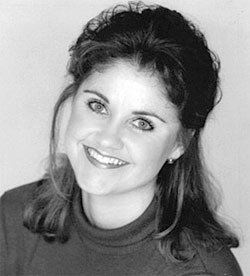 Tracy Jo Wilson attended the University of North Texas in Denton on a track scholarship and graduated in 1984 with a Bachelor of Arts degree in journalism with a specialty in public relations and minors in radio/TV/film, English, and business. She always had a passion for sports, so it is not surprising that she decided to enter the field of personal fitness and training, ultimately training over thousands of runners, racewalkers, and walkers. Wilson was a Certified Physical Fitness Trainer and an Advanced Personal Fitness Specialist. She worked as Fitness pro with The Cooper Fitness Center and as an Instructor for The Cooper Wellness Program; she was for several years the marathon coach for the Leukemia Society’s Team in Training program and for the Arthritis Associations's Joints in Motion marathon training program. She was a member of the International Association of Fitness Professionals (IDEA) and the American College of Sports Medicine (ACSM). She was the founder and president of Fitness Success Enterprises and Southwestern RaceWalkers Club and a Master level Racewalking judge and official with USA Track and Field. Wilson did weekly fitness segments on the morning news shows on Channel 11 in Dallas; she appeared on Dallas’ Channel 8 “Good Morning Texas” and on sports radio talk shows. Her dedication and determination has been an inspiration to many. Her zest for life was contagious as she motivated and inspired many. In August 2001 a few weeks after celebrating her fortieth birthday, Tracy Jo was diagnosed with stage 3 ovarian cancer. She underwent a radical hysterectomy and began chemotherapy. In the course of her treatment, Wilson underwent multiple forms of chemotherapy, as well as radiation therapy for isolated tumors. A continuing inspiration even while living with cancer, she continued to coach others and to workout. Tracy Jo battled fiercely for three and a half years after her initial diagnosis and passed away on October 19, 2004.